hourglass knitalong: Welcome to the Hourglass! Welcome to the Hourglass sweater knit-along! Join us as we knit this sweater featured in "Last Minute Knitted Gifts" by Joelle Hoverson of Purl in Soho. To join the knit-along, just leave a comment to this post. Include your name, your email address and your blog address, if you have one. We'll add you to the sidebar. Don't forget to copy the knit-along button for your own blog. This will be an on-going knit-along, so, don't worry if you need to start after the holidays! HI there!! I just joined up! I can't wait to start this after the holidays!!! i'll be starting post-holidays. Can't wait to see everyone's work! I would love to join it will be after the holidays before I will be able to get started with it. I am starting this sweater after the holidays. I would love to join your knit a long, I always get such good tips from KAL's. Ooh! A reason to step up this sweater's position in the lineup - a KAL! I've got the yarn and the pattern, what more could a girl ask for? Oooh - a KAL for the yarn and pattern I already have - Happy day! This puppy gets fast-tracked in the lineup now. Yippee! Please add me to your list. I'm very excited to see this KAL! I'd love to join everyone else. 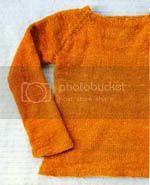 I'm unimaginative - I'm doing this sweater in exactly the same shade as in the book - Cash Iroha in Orange. I've been waiting for my holiday knitting to be finished before starting this sweater...now I can!! I'll be using Noro Cash Iroha in Color #31, a rich purple. Can't wait! ok, i messed up, (geez, i shouldf be doing better by thursday, don't you think?) anyway, i would like to join the KAL. i will be using cashiroha #81, which is listed as a brown, but has a blood-red quality to it. i should start this weekend! Please count me in - don't have a blog. Now that the holidays are over I'd like to get going on this sweater. Will be shopping the stash to select a yarn. I've been knitting (and blogging about) this since November, but I'd love to join, if I'm not too late. I've been knitting (and blogging about) this since November, but I'd love to join the knitalong if I can. I'm doing mine in Rowan Felted Tweed and I'm just about ready to join the arms and the body. I started this sweater on January 29 and just knitted the second decrease row. I'm trying out the new KnitPicks Merino Style in cinnamon. The gauge is right on, but the color is very flat compared with Cash Iroha. I'm thinking already that it may come out too dull, and that I'll want to finish the neckline and cuffs with aqua or pink edging. We'll see. hi! i just started day before yesterday... three inches maybe? i'm doing it in Manos. i'm going to post a link here, ok? Hey there, can I join too? I've just decided to use this pattern for some cashmere yarn that I've reclaimed from an old store-bought sweater. Are stragglers welcome?? I started the hourglass sweater yesterday and just came across this knitalong. May I join? Sophie, yes, you may still join the Hourglass KAL. The insight and tips others have added to the blog so far have been very helpful. Can't wait to see your progress. Send your email address, blog link and what you'd like to be called to kelly3000@myway.com. I've just found this blog, and am going to buy the yarn for my Hourglass sweater tomorrow! Can I still join? Hope it's not too late. I'm in...I love the design of this sweater. On my way out to find some yarn. I've enjoyed following this knitalong and wanted to share my hourglass sweater, too! The Cash Iroha was a dream to knit with. There are a couple pictures of my sweater posted at www.homepage.mac.com/romila/knitting/PhotoAlbum40.html. Thanks everyone for sharing all of your extremely helpful tips and photos! hiya! add me please :) i'm making a faboo cashmerino version. thanks! can i still join the knitalong by posting a comment here? well if i can i would love to join, as i just got my cash iroha today in a gorgeous greeny/teal color. mmmm. Hi, I'm Amy/WittyKnits, and I'd love to join the Hourglass KAL. I'll be starting soon, I promise. Hi, I'd like to join in as well. I already finished my Hourglass Sweater last week and it's on my blog. I love it! I may make another one with different yarns. Hey, cool, I just started one of these! I've never done anything-along, but this is my first sweater and I'd love to join in if I'm not too late. Can I, oh purty please? I just started this sweater last night and would like to join you all. Hi. I want to start on the Hourglass sweater. I think the book I have says I need 9 skeins for size 37. I don't know if my book has the corrections or not. How much yarn is everyone else using? Thanks. Hi! Can I still get in on this? I'd love to join up. Thanks for hosting! I'd love to join up! I'm still trying to decide what yarn to use so I plan on browsing everyone's completed sweaters! Could i join up ??? this is so great!! i was on day two of the hourglass sleve #1 and chanced upon you guys searching for more cash iroha colors. YAY!! i managed to find two more skeins in the red (#91..so amazing) same dye lot...the last two at the store so thanks to this wonderful group of knitters already...i would have run out of yarn for sure without the advice here. i love the cash iroha...pricey but so soft and the color is unreal. i'll be here daily until i finish! i'd be willing to trade them with someone, might be easier than ordering. i'm in canada so it would be great if you're in canada as well, but if you're in the US that's cool to. let me know if you're interested. happy knitting! Sign me up! I'm knitting mine in Jaeger Shetland Aran in a lush dark burgundy. Not exactly springlike, but it will be absolutely lovely come autumn. I already have a problem. How on earth do you join the sleeve? I am soooo confused! This will be my first sweater! I have been wanting to make it for months and finally just purchased some yarn online. I will be using the Knit Picks' Andean Silk yarn in the color lettuce! Hopefully I can start in the next week or two once it arrives! Oh, and my email is dani44@hotmail.com! Hi all! Coming to the KAL a little late. Took me awhile to win some noro cash iroha on ebay but I'm all set now with #61...a deep purple. Sign me up. Most of you are finished before I even ordered my yarn. But I've been dying to knit this sweater ever since I laid eyes on it. It's my first so wish me luck. After perusing all of your blogs, I'm going to give it a shot with Cascade 220. Can't go wrong with the sale price from Webs. And since I'm sure to make a mess of it, I won't feel so badly. I'm backlogged on projects but a friend and I bought the yarn for this sweater awhile ago. We live on opposite coasts (I'm in CA, she's in NY) but we planned to do a knitalong -- we thought next Fall, when the weather cools off. I'd like to join up as well. I have just ordered the yarn for this sweater (finally). Does anyone know if the rumor that it is being doscontinued is true? Also, please pardon my blog. I've just started it as a place to record my knitting. Hi. I'd like to join the knitalong. I'll be using some yarn from an overly enormous deconstructed J.Crew sweater I picked up at a thrift store. It's a gorgeous pattern, and it'll be my very first knitalong. Thanks! Sign me up! Got the book today and am swatching up some Debbie Bliss Alpaca Silk -- seems a bit heavy and my guage is off. Any one else use this yarn? Would love to use the Cash Iroha -- but hopefully I can make the DB work as I have quite a stash of it. Talk to you soon. Already made my first hourglass, to not so good results, prompting me to join & shre attempt #2 with others. The unfortunate result of #1 is on display at my blog. hi i would like to join the knit a long! Hi!! I just happened to be starting this sweater and then found this knit-along! I'm using Noro Cash Iroha in an olive green color. I love the shape of this sweater so I'm hoping it turns out well! Woops, forgot to add my info to the above post! I just found this and since I wanted to make the Hourglass sweater ever since I bought Last Minute Gifts, I thought that joining a KAL would give me an incentive. I have not decided on the yarn yet, but I can't wait to start! Better late than never I guess! I just bought the book and yarn, and I've just finished the decrease portion of the front & back section. So I thought I'd join in too. Is it too late to join? I just started mine in orange Knitpicks' Andean Silk. Hi everyone. I'm so glad to find this KAL as I have just decided to knit the Hourglass myself. I'll be using Crystal Palace - Mikado Ribbon for mine. Trying to sign on again. Tried to once, but my name didn't appear on the list of knitters. I'm hoping to use Debbie Bliss Alpaca Silk or Noro Silk Garden. Have to decide soon, as this is the project I want to bring on holidays. Hi everyone! I'm excited about starting the Hourglass Sweater and have half a dozen finished ones in my head already. LOL I'm still picking out my yarn but am looking forward to starting soon. Got my yarn (Noro Silk Garden) and the pattern set to take to the lake next week to get a start. The completed sweaters are all so lovely. Hope mine will fit as well as all the posters'. I'd like to join, too. I'll start as soon as I get my yarn. Hi. I just started the Hourglass. So far, it's great! I'm using Pakucho organic cotton from elann.com as an inexpensive substitute! Even though this started awhile ago, it looks like people are still joining so I will too! I already bought my yarn - andean silk from knitpicks. Instead of my email address, you can just contact me at my blog. hello! i know i'm coming to the group late but i've been wanting to make this pattern since i bought "last-minute knitted gifts" back in december. i'm so excited to see some nice yarn substitutions and i'm looking forward to ordering some yarn. Joining this KAL so my first sweater doesn't turn into a complete disaster! I'd like to join up, too. Thanks! Hello! I stumbled upon this knitalong (coincidentally because I just started my hourglass sweater last week)Cannot wait to see everyones sweaters finished! I just started yesterday w/ Andean Silk from Knitpicks (in lettuce). When I can get my digital cam to work I'll post pics. Had trouble using the Blog that was set up for me. So am trying again - I'm part way through the first sleeve and love the sweater so far. Had to narrow the sleeve though. I finished my swatch today and will be making this in Plymouth Turino Silk color 7. I'd like to join. This is my first KAL. The Hourglass Sweater is also my first sweater. I completed my swatch this weekend. Looking forward to the adventure! I cast on for my hourglass sweater last night. I am using Noro Silk Garden #84 and knitting the 41" size. It will be right for my bust--hope it's right for the hips! I'm swatching for my hourglass right now. I'm using Noro Cash Iroha Color #35. I'm about 15 rows into my Hourglass. I'm knitting the smallest size and using Rowan Handknit DK Cotton. Just finished mine, have comments to share. I just started this week and am almost through the decreases. I'm excited about finally getting started after looking forever for just the right yarn! You can see my progress there. I am up to where I split for the yoke, but I am waiting for needles to come in the mail for the sleeves. I'm still to scared of dpn's to attempt them, despite what my local yarn shop recommended! Hi! I'd like to rejoin. My blog is http://www.knitpowerstopeace.blogspot.com, my e-mail address is Illanna24ATaolDOTcom, and I am using Artyarns Supermerino. I'm already set up to post on the blog, I just need to get back in the sidebar. Thanks! Please add me to the knitalong. Thanks! Can I be added to this knit a long? i'd love to join even though i'm almost done... i'm adding a hood, has anybody tried this? i'm worried now that i see all these comments about big necklines! Can I join if it's not to late? Please add me too! I finished my Hourglass already but am new to this whole blogging thing. I'd like to post a finished pic. i would love to join..how can i do this?? Hi. I am about to embark on my first sweater journey and love the hourglass pattern (and have enjoyed seeing all the different color and yarn combinations you have all come up with). I have read that it runs on the larger size, especially after blocking. How would I alter the pattern to make it fit me (petite, size 2-4)? Is the smallest size too big? Any advise would be greatly appreciated. I plan on using the Cash Iroha. I'd like to join. This will be my first adult sweater. I've just started; I'm on the second decrease section. Because I live on the Gulf coast, I'm making this out of the much lamented, discontinued Cotton-ease. If there's a time to knit a sweater, this is it! I'd like to join the knitalong! I got a blog since I joined, so you can update me! I have the perfect yarn for this sweater, its called Licorice Twist from Spinners Hill (sorry no website, I'll post more specifics later). The stockinette in the round will be a welcome distraction from a busy work schedule! Hi! Please add me to this knitalong -- its my first one. Exciting! Hi everybody! Just started tonight. I'm making it for my mom for xmas. Can I finish in 10 days? Stay tuned to find out! I'm using Cascade 220 Quatro in a pink tweedy heathery color. It was only $7 a ball and each ball is 220 yards so I only needed 5, compared to the Noro which was very beautiful and soft, but hella expensive. Gotta go- got a lot of knitting to do! Hello all! I've just made the decision to use KnitPicks Andean Silk to make my hourglass. I'm so excited! Hi there! I've been dying to start this sweater (my 1st!) and finally found what I want: Sensations Dolcetto. Mary, I sent an email, but wanted to post here as well to see if there are still signups for the KAL...I'd like to join. I'd like to join! I've already started and have an update or two. I'd like to join. I'm up to the sleeves now, which means I might actually finish it! Oh, I forgot to say I'm using Knitpicks Andean Silk Twist, and my email is kmelkight at gmail. Ahh! I'm so thrilled to find other people making this sweater! I'm JUST starting, and I'm not a very fast knitter, so I hope you haven't all disappeared by the time I'm finished. I'm using Plymouth Indiecita Alpaca that I bought for a different project and didn't finish. Has anyone tried a tubular hem and sleeves instead of the method the pattern uses? My email address is andrea.ryer at gmail dot com. Hello there, me too, me too. I am knitting mine for the 2006 Knitting Olympics out of EL Silky Wool. I'd like to join. I'll make this for the Knitting Olympics. I'll choose my yarn in the next couple of weeks. Please sign me up! I can't start right away, but I've already got gauge on my swatch using Classic Elite Miracle. Count me in! I've just started and have progress to post! Hello! I'm joining in. I'm also knitting this as my Knitting Olympics project. So if all goes well I'll have it done by closing ceremonies. I would like to join, please! I'm planning to use SWTC bamboo. it looks great! I love the trim. Starting late is better than not at all. Casting on tomorrow. The FO photos look great! Hello, I would like to join the KAL. Thanks. I would like to join this KAL as well. I will be making mine in a discontinued shade(#79) of Cash Iroha that I just won on ebay. hey! count me in too please... i'm going to be making the hourglass in elann's peruvian collection quechua (alpaca/tencel). it's a lovely crimson shade. Hi, I am slowly moving on my Hourglass Sweater. I am using Gedifra Stripe in Pinks,Purples and Reds. I love it!! I have been busy with other projects, but this weekend I am going out of town and plan to bring the sweater with me for some much-needed quality time! I love seeing everyone's results! They're all great!!! it's so nice to see how other people's hG sweaters turned out... i could use some feedback -- can I join too? I've started already, using Knitpicks Andean Silk. i'd love to join in... I already started this item, but i've never done a KAL before, so i'm excited. i have kool aid dyed four hanks of it and am going to do a stripey yoke. i am posting photos on my blog tonight of the dyed yarn and my progress. I'd love to join in, too. I am knitting hourglass for the olympics and am using kid classic in olive and baby blue. we'll see if i can finish it by the 26th! Hi. I would like to join this knitalong please! I just ordered my yarn from Knitpics. I'm using Merino Style in Cinnamon. I cant wait to make it. I now just have to order away for the needles and I'm on my way. Hi, I'll love to join and this will be my first KAL. Hope it's not too late... I started mine last Saturday and now about 8 inches on the body. My finished Hourglass with comments on the pattern changes I made can be found here. Can't wait to join the hourglass KAL. I purchased my yarn today. I'd like to join the KAL. I just cast on today, so please count me in! I'm using Cash Iroha #2. Hello from Paris (France) ! I launched a KAL for the same sweater, in french last january. From the beginning, i put a link towards you kal and the blogs of your members. Thank you for having done this before, it really helped ! Hello - I'm actually done and need help! My Hourglass fit perfectly, then I blocked it and the Noro stretched like mad. Any ideas?! Hi ! I'd Really like to join the knitalong. I would love to join as I just recently started my sweater! Thanks! Can I join? I've got pictures to post! Would like to join the knitalong to motivate myself to finish my hourglass sweater. Am a little intimidated by the finishing of the neck. I'm a little late here, since I just finished mine. But I managed to avoid all the hemming with a few simple mods on the edges - don't know of anyone else is interested, but check it out here. The finished sweater really doesn't look that different without the hems! Hi there! This is Daphne from http://dlittlegarden.blogspot.com/, email dlittlegarden@yahoo.com. I just ordered a ton of Knit Picks Andean Silk in Orange to knit myself the Hourglass. Can't wait to get started! I am looking forward to knitting this sweater - I just picked up the book today. i'd like to join; i've been meaning to make this sweater for a long time. Hi, Can I be removed from the knitalong blog? Thank you. I've loved this knitalong, but would also like to be removed. I'm cleaning up my blog list.